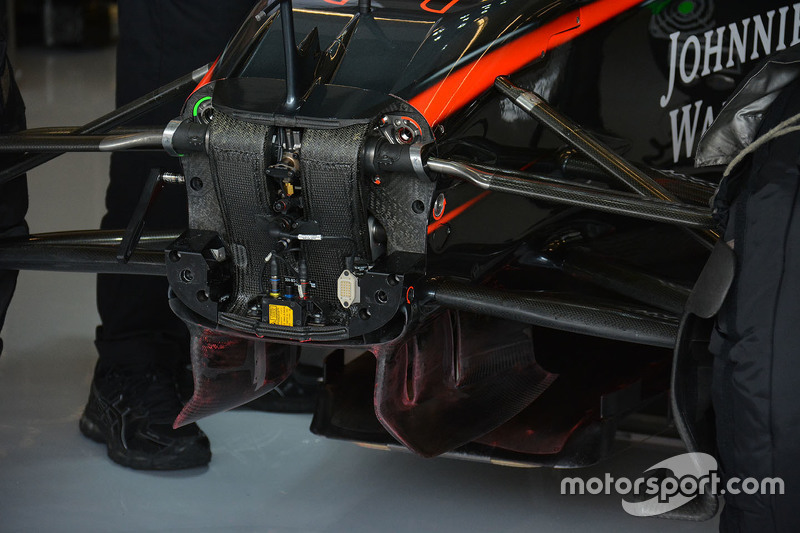 McLaren's push towards the sharp end of the grid is not exclusively down to engine upgrades. 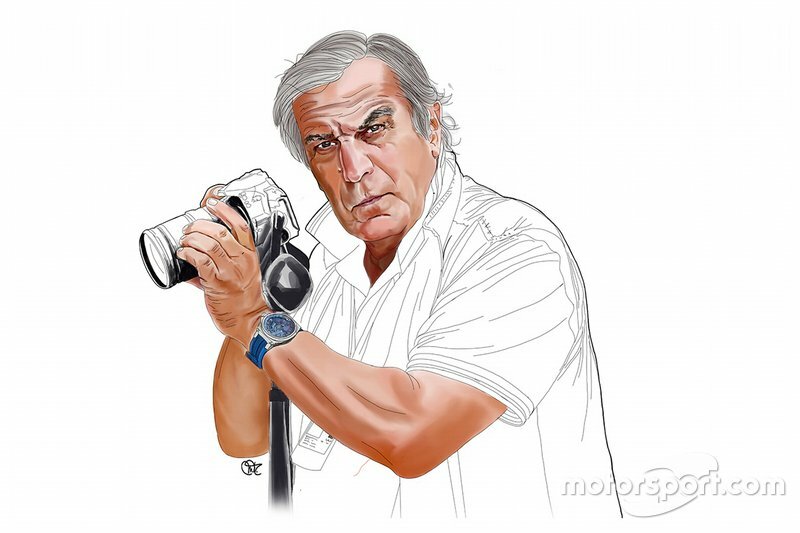 Giorgio Piola looks at the technical developments brought by the team to Austin. While the focus for much of McLaren's performance gains have revolved around improvements to the Honda engine, the team introduced some interesting new aerodynamic concepts at the United States Grand Prix. 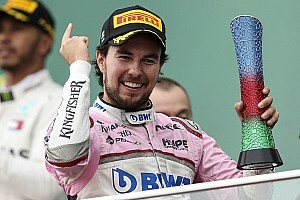 Although the poor weather has limited the feedback possible from running the new items, the fact the team appeared so competitive in what limited running there was has at least lifted optimism of another step forward. Here, Giorgio Piola outlines the changes that have been made, where McLaren has taken on board some ideas used by Ferrari and Mercedes. Back at the Singapore Grand Prix, Ferrari tweaked a floor concept that it has used since the start of the season. It replaced three slots in the floor in front of the rear wheel, with a nine-slot design. The aim of these slots is to direct air to the area just inside the rear tyre and offset the phenomenon known as 'tyre squirt' – whereby air spills off the revolving wheel and upsets the airflow (and performance) of the diffuser. Having more confidence that the diffuser will not stall allows teams to be more bold in the amount of rake that can be run, and therefore how long they can run the floor and front wing. 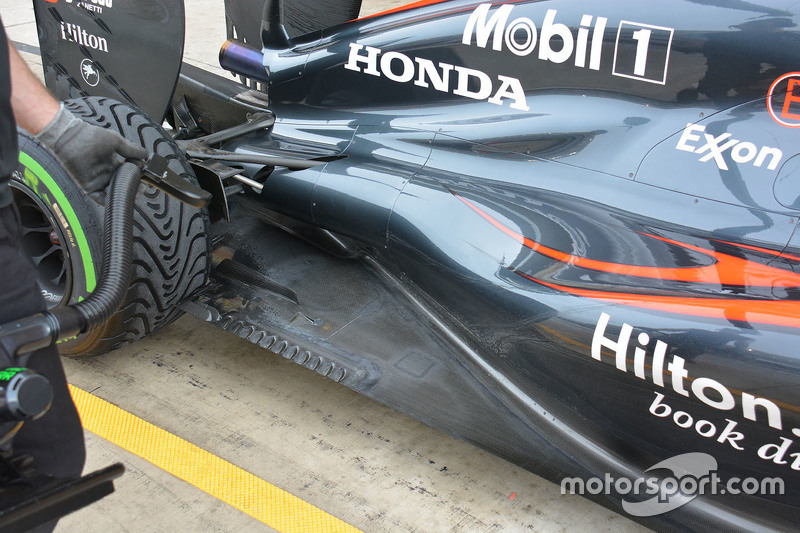 McLaren has taken the idea to the next level though, for its design has 11 slots. As well as the slots, there were two other longitudinal flaps and two other holes in front of the rear wheels to further improve the airflow channelling. McLaren has been able to make these tweaks because the new exhaust layout of the updated Honda has given it more room to play with. 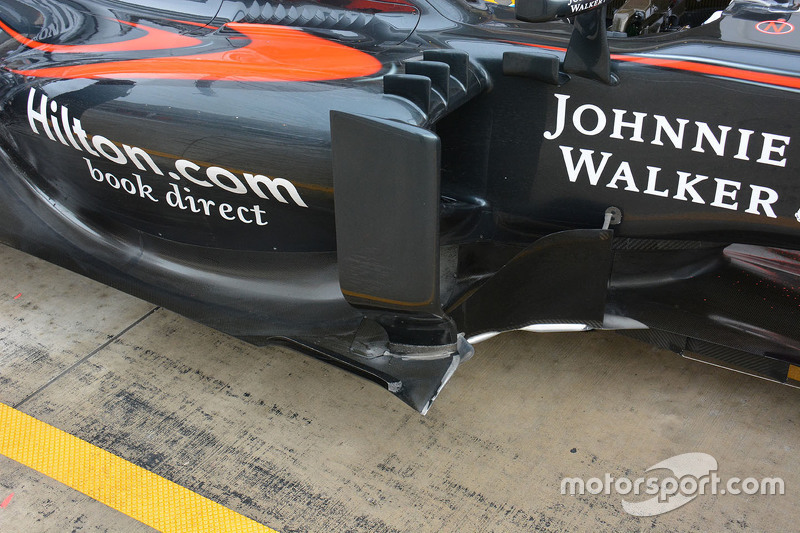 McLaren has begun evaluating its aerodynamic concept for 2016, and part of that has resulted in a new front wing idea being run too. The new design copies the style pioneered by Mercedes – of a flat 'floor' step just inside the end plate – to help better channel airflow. This idea was initially only run by Mercedes, but Ferrari and Red Bull also went down this avenue when they realised the extent of the performance benefits. 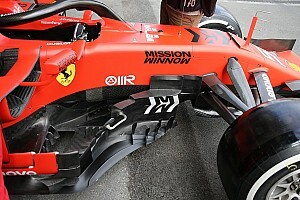 The endplate also features a new hole towards the rear. As well as the new concepts at the front and rear of the car, McLaren has also changed the designs in other areas of the car. 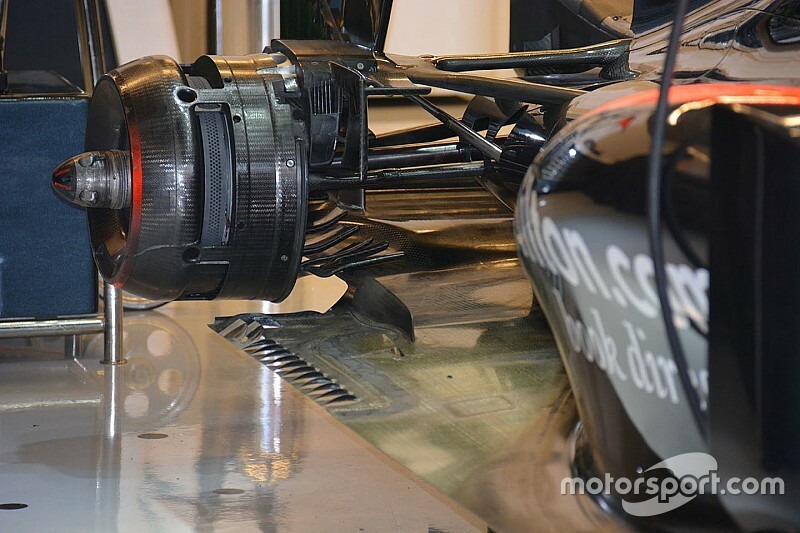 Underneath the nose, the turning vanes have been tweaked to help channel airflow better to the underside of the car. 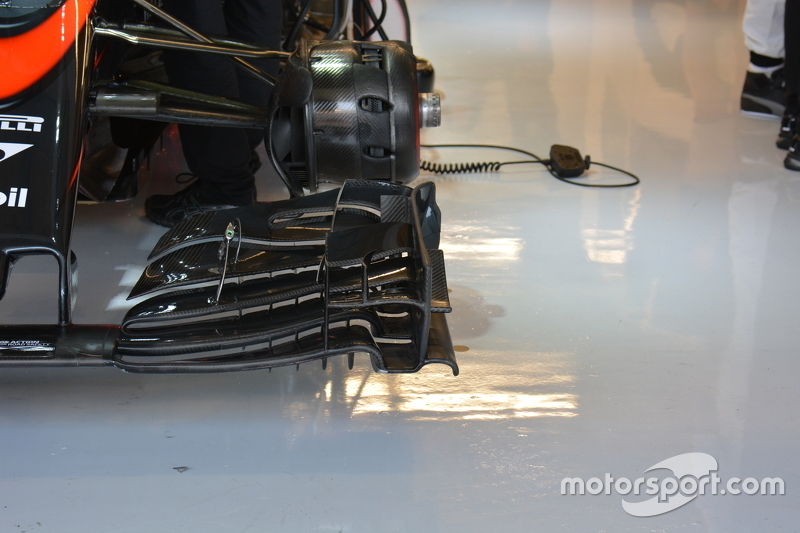 As the photograph shows, tests took place on Friday featuring two slots on the left-hand-side vane, with the right-hand side having been closed off. The red in the image is flow-vis paint, which suggests McLaren wanted to trial the impact of the changes in terms of how it impacted on the underside of the car. Another change is in front of the sidepods, with the area around the turning vanes having been expanded.